The Holiday Season for the Philadelphia Jazz Project is all about 'Giving Thanks to You', our audience! 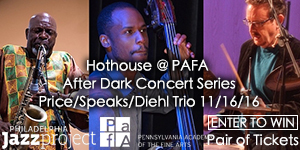 The Hothouse @ PAFA After Dark Dark Concert Series is held at the Philadelphia Academy of the Fine Arts. Hothouse concerts are free with paid entry into the museum. So we're giving away 3 pairs of tickets for paid museum entry to the Philadelphia Academy of the Fine Arts for the November and December 2016 Hothouse @ PAFA After Dark Concert Series dates! 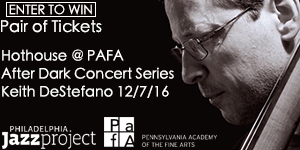 The giveaway will include a pair of tickets for entry into the Philadelphia Academy of the Fine Arts for either the 11/16/16 or 12/7/16 Hothouse concert date, a CD from a Hothouse featured artist, and PJP T Shirt! You can signup for the giveaway through the iradiophilly contest page. Three lucky winners will be randomly selected by iradiophilly the day before each Hothouse concert date, and recipients will be notified by the e-mail they provide in the giveaway signup form. Full details on both concerts below! The Price Speaks Diehl Trio is an exceptional Philly-based ensemble consisting of three dynamic group leaders, who have come together to make musical mayhem. The members are; alto saxophonist and composer, Larry Price; who has only been in Philadelphia for just about two years. He came here from a 15 year stint in Finland, where he was an important fixture in the Scandinavian Jazz scene. He is joined by bassist and composer, Nimrod Speaks; one of the most in demand bassists in the MidAtlantic region and a powerful songwriter. Joining them and rounding out the group, is drummer, bandleader and composer, Kevin Diehl, who heads up the prolific ensemble, Sonic Liberation Front and its various incarnations. These three firebrands will share an intense evening of music that will vigorously move from the sweet and sublime, to the outer reaches of the musical universe. Get ready for a wild ride. 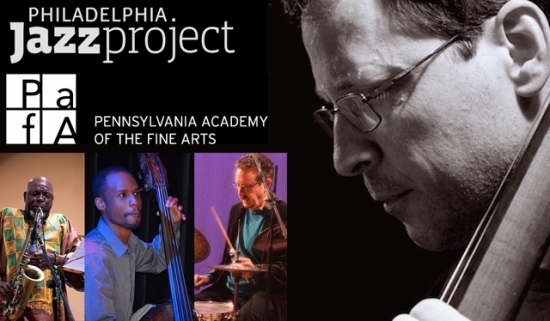 Keith DeStefano is a Philly-based, bassist/composer and leader of the ensemble Puzzlebox. He combines the traditional with the avant-garde, taut arrangements with free jazz, classical influences with genre music, angular bitonality with gentle lyricism, far out grooves with driving swing. He has been featured in DownBeat, NPR, TV12, WHYY, WRTI and radio stations across the country. In 2014 he was Music Director and arranger for a 17 piece big band at the OutBeat International Jazz Festival in Philadelphia. He has performed with Puzzlebox at the Cape May Jazz Fest, West Oak Lane Jazz Festival, World Café Live, Philadelphia Clef Club of Jazz, West Chester University, University of Pennsylvania, Trenton Grounds for Sculpture, Chris Jazz Café, West Oak Lane Jazz Festival, Twins, Ortleibs, and numerous venues in the region. Keith DeStefano will present Bass in the Face. A performance of original Jazz, inspired compositions that will explore and feature the textural possibilities of bass clef instruments. The lower sounds of the spectrum. The Low End. The Bottom. The performing ensemble will comprise of double bass, tuba, bass clarinet, baritone saxophone, trombone, and percussion.